I’m loving using my One of a Kind stamp set and the coordinating Boho Blossoms punch. Have you noticed?!! I can’t believe I nearly didn’t buy it! 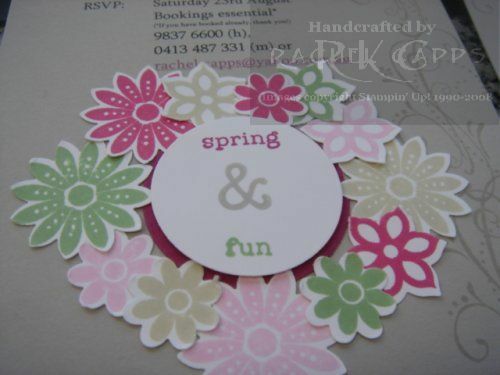 This is one of the cards we made at my Spring Mini Catalogue Launch Party at the beginning of the week. 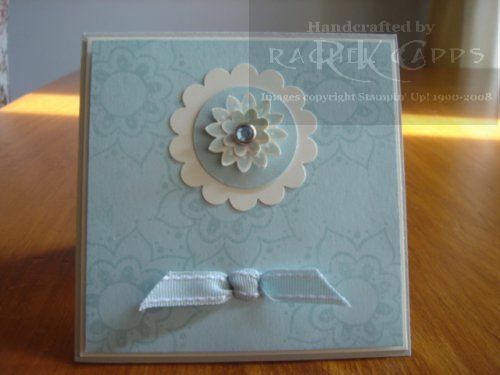 This was the original card I based the make and take on which used Sahara Sand, Very Vanilla and Soft Sky cardstock. I let my guests choose which ribbon and rhinestone brads they preferred to use from a selection. A lot of my guests used the Blue Bayou stitched grosgrain ribbon and that looked lovely as well! Do you prefer the Whisper White or Very Vanilla? 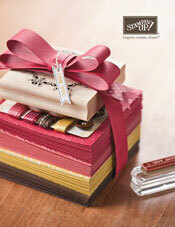 And do you prefer the stitched grosgrain or taffeta ribbon? I’d love to know! A very special member of the team I work with left us last week to move to the sunny shores of the Gold Coast and so she could complete her law studies full time. She will be sorely missed! This is the card I made for our team to sign. There are few people I think I could stamp the words “One of a Kind” on a card for … but Brie is one of those people! I’ve used the retired Headline Alphabet for the word FAREWELL (thanks for lending it to me, Cherie!). I then cut out each letter and covered each letter with Crystal Effects and Dazzling Diamonds and stuck them on with Dimensionals. The background stamp is En Francais and “you are one of a kind” comes from One of a Kind (in the current Spring Mini Catalogue), sponged around the edges. The colours are gorgeous … Purely Pomegranate textured cardstock and Pretty in Pink. And to finish it off … a beautiful Styled Silver Hodgepodge frame (again, from the current Spring Mini Catalogue). This is the first card I have used the new Purely Pomegranate wide satin ribbon (available in the mini catalogue) and the whole card grew from my having to use this beautiful ribbon on the card. Then I found a fabulous card on Splitcoaststampers and it was my inspiration for all the rest … check out the other card here. I used the stamp set One of a Kind with its coordinating Boho Blossoms punch, and the other stamp sets are Wonderful Words and Everyday Flexible Phrases. There is some gorgeous Silver Styled Hodgepodge Hardware (which I think looks stunning on cards!) and I’m starting to be brave and use my Crystal Effects (with Dazzling Diamonds) too. We will be using One of a Kind with its coordinating Boho Blossoms punch at my Spring Mini Catalogue Launch Party tonight … so come along and have a play! Email me now to book your place. I sponged around the edges of the Regal Rose cardstock with Regal Rose ink. And I paper pierced around the edge of the Very Vanilla cardstock. Well, this year my Dad turned 60! Dad doesn’t live nearby and he is visiting at the moment, so I can now show you the birthday card I made for him. I really wanted to try and make a masculine card … meaning no flowers! That is a challenge! Instead, I went with a stars theme … cause my Dad’s a star! hehe! Plus I stuck to mostly neutral colours with Basic Black, Copper and Very Vanilla … with a dash of Soft Sky and Tempting Turquoise. The stamps I used were Classic Stars jumbo wheel with the Large Star and Star punches, Wonderful Favourites and Best Friends Numbers. I also remembered to use my Hodgepodge hardware for once! That was nice! I love the Soft Sky ribbon too … I couldn’t help putting ribbon on the card. Sorry Dad! hehe! If you’re not familiar with Faux Stitching, I recommend you join my newsletter group. This months’ newsletter contained a tutorial on this great effect. So simple! This is a close up of the first group of invites I made using the new stamp set from the Spring Mini called One of a Kind and the complementing Boho Blossoms punch. 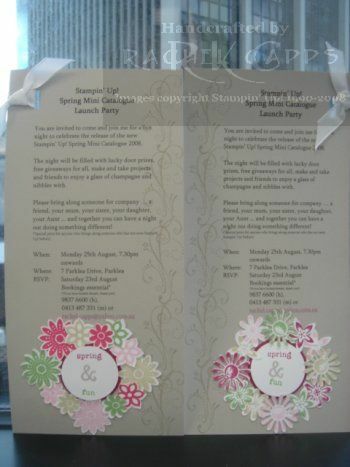 If you come along to my Launch Party you can make a card using this stamp set and the Boho Blossoms punch … it will be fun! This is a close up of the second group I made using the stamp set from the Idea Book & Catalogue called Looks Like Spring and the complementing Spring Flower Bouquet punch. I also used the stamp sets Priceless (down the side) and Everyday Flexible Phrases. Even if you have not received a hand made invitation, you are still welcome and formally invited to come to my Launch Party. Bookings are essential, so if you haven’t booked already, email me now! This is a birthday card I made for an old friend’s son’s 4th birthday, whose party we went to today. 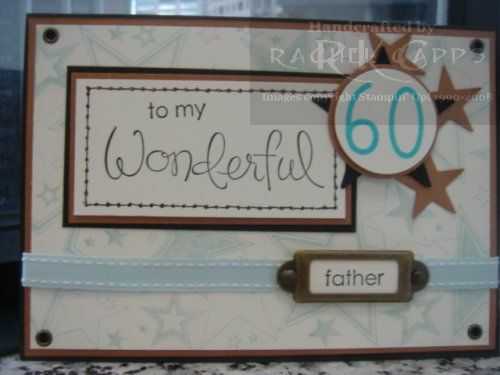 I honestly couldn’t put a ribbon on a little boy’s birthday card … it didn’t go with images of Batman or Spiderman!! I’ve used the colours Ballet Blue, Real Red and Basic Black for a more masculine card. 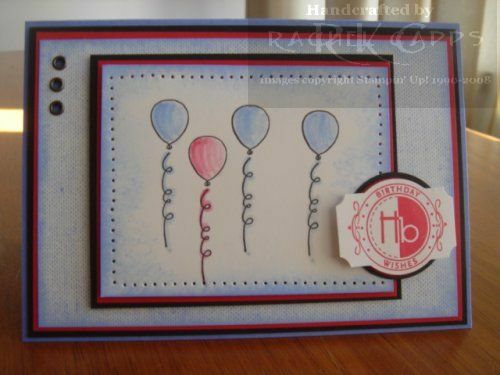 The stamps I have used are from Birthday Best, Canvas background and the Level 1 Hostess stamp set, Party Punch. 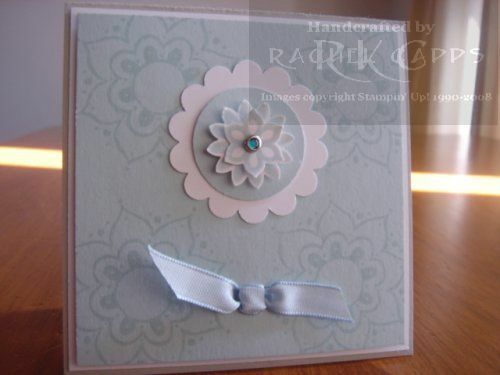 I’ve done lots of sponging on this card and paper piercing too! I hope you like it (and I hope the birthday boy liked it! ).